The screws attaching the SX4's side mirrors can be rattled loose from road vibrations, potentially causing the mirror to fall off the vehicle. LOS ANGELES -- American Suzuki is recalling 69,587 SX4 models because the vehicles' side view mirrors could become unhinged. 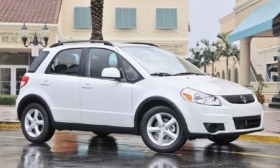 The recall affects all 67,377 SX4 hatchback and sedan models from the 2008-2009 model years and 2,209 vehicles from the 2010 model year, plus one SX4 hatchback from the 2007 model year, according to documents posted on the National Highway Traffic Safety Administrationcq Web site. At fault are the three screws used to attach each side view mirror to the vehicle. The screws can be rattled loose from road vibrations, potentially causing the mirror to fall off the vehicle. Dealers will replace the screws with new locking screws, free of charge, Suzuki told NHTSA. “Replacement screws are on their way to Suzuki dealers, and customer vehicles will be refitted as quickly as the parts arrive and customers make appointments with their dealers to have their vehicles serviced,” Suzuki said in an e-mailed statement. Suzuki's U.S. sales topped 100,000 in 2006 and 2007 but fell to 38,689 in 2009 and are off 49 percent this year.